Firecooked! 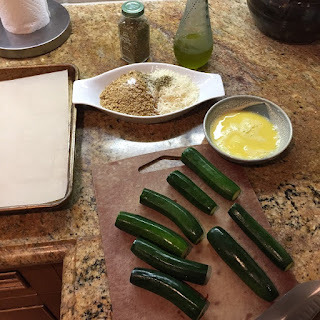 : Bread Crumbs and What to do with them! 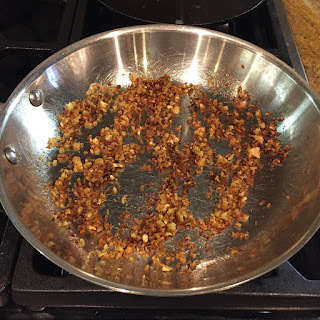 Bread Crumbs and What to do with them! A new study about food waste came out this week, claiming that the typical American wastes about a pound of food per day. And that the worst offenders were healthy eaters, because fruits and vegetables comprise 39% of the wasted food (followed by dairy and meat). What surprised me was that bread was not on this list. I know I do better than most on using up fruits and vegetables, I have a lot of strategies ranging to buying really fresh product at the farmers market, to sweep-the-veggie-drawer recipes, like Pasta Whatever and Quesadilla's... just check the "Random Vegetable" link. But it seems that I'm constantly tossing bread that is moldy or stale. I know its in part because I buy bread that isn't loaded with preservatives, but the reality is that we just don't eat enough sandwiches or toast to go through a full loaf in a week or so. Or you get (or make) a nice "artisan loaf" to go with soup, and its stale the next day. I do toss bread into the fridge after a few days, and it's still good for toast, but after about 10 days it's stale even for toast (and likely starting to mold). So.... I have been trying a few new things. First has been to get more proactive about making dry bread crumbs, which keep for a long time in the freezer. But of course, this doesn't help unless you actually use the bread crumbs from the freezer. 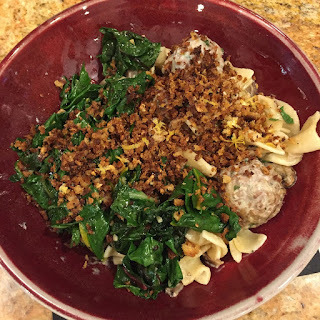 I have a couple of recipes that use bread crumbs, like Spinach Crusted Quiche, and meatballs (and hopefully will get around to posting that recipe). But I needed more outlets for bread crumbs, because storing crumbs in the freezer for a year and then throwing out is not reducing waste. 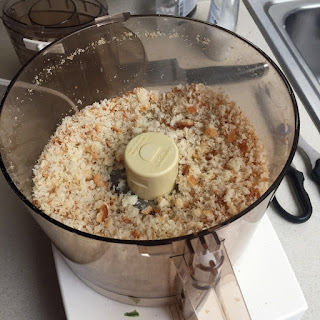 I have managed to stumble across a few of recipes that use a lot of crumbs (by stumble, I mean I found one, then googled and found another 100 similar recipes, then pulled together the way that seemed best to me). 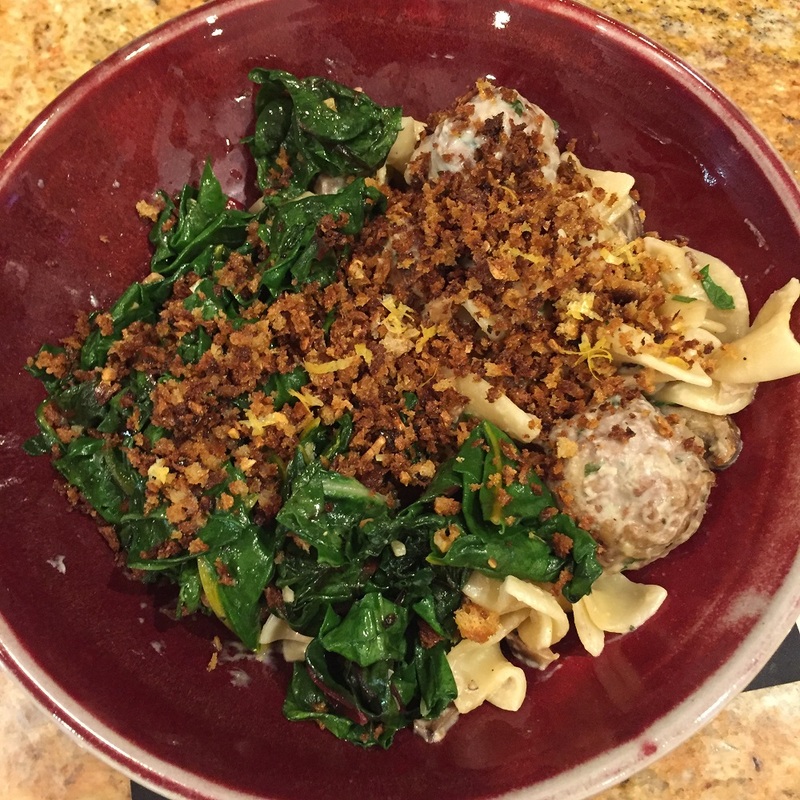 The first is a Bread Crumb Topping that you put on pasta or salads. This is something that really elevates a ho-hum salad or leftover pasta. 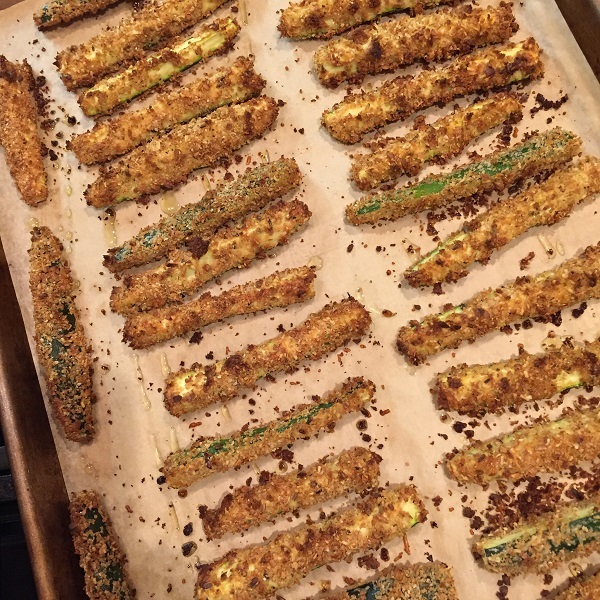 The next is Oven-fried Zucchini. 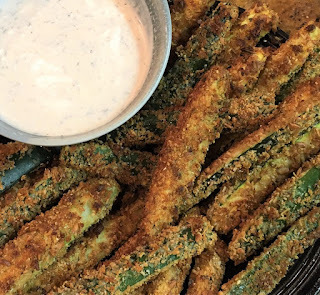 Way back (we are talking about my college days) many people "discovered" that they liked zucchini when it was breaded and fried. I will admit these are not quite the same, but they are quite tasty and actually pretty good for you. How do you use bread crumbs? First, let's cover making bread crumbs. You can use any kind; white, French, whole wheat, whole grain, seeded, etc., but I don’t like to use bread that is on the sweet side (> 2 grams sugar per slice according to the nutrition label), like a honey wheat or most of the whole grain breads. Sugar will cause the crumbs to brown faster, which might be a problem in some recipes. Plus I'm just not a fan of sweet tasting bread (and yes, I'm the crazy lady looking at the label of every loaf in the store). Leftover bread, preferably stale, torn into chunks. Sandwich bread is fine as long as its not sweet. Oven: 300F, convection if you have it. Place parchment paper on a sheet pan (or pans, depending on how much leftover bread you have). 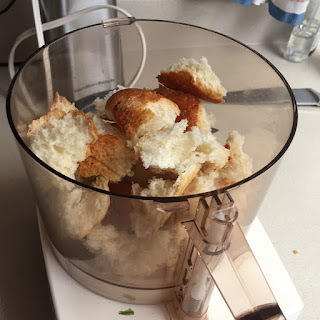 Place 1 - 2 inch chunks of bread into the bowl of a food processor, filling up to about half to three quarters full. Pulse until broken up, go with longer pulses until the bread is in crumbs. Put crumbs on prepared sheet pan. Repeat if you have more bread. Keep the crumb layer to less than a ½ inch. Place pan in preheated oven. Toss after about 10 minutes. 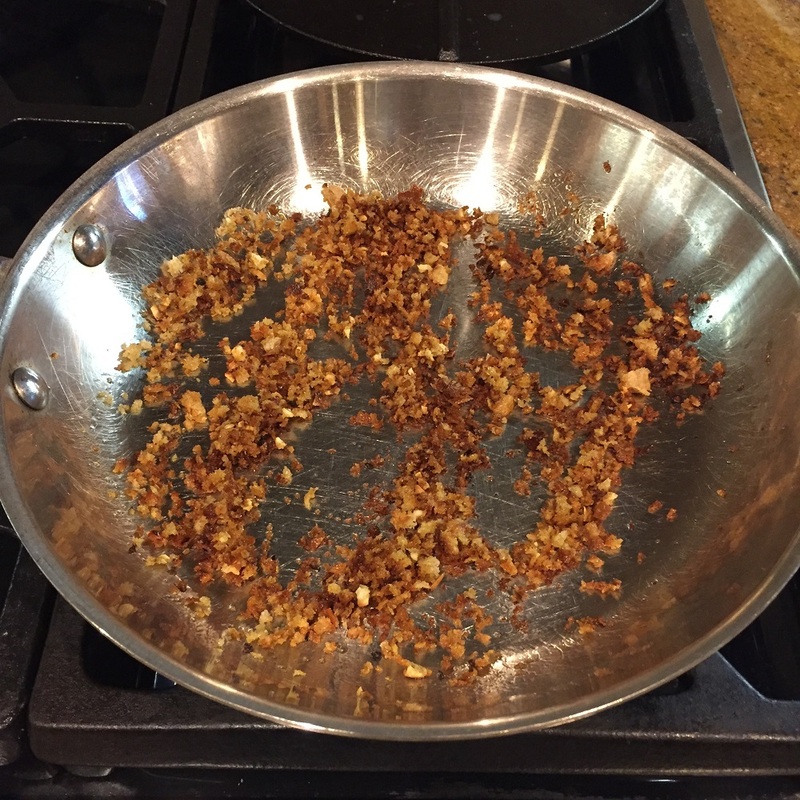 Then check every 5 minutes… goal is dry crumbs, not toasted crumbs. It generally takes 15 - 25 minutes. Let cool completely. If the crumbs are a bit big for what you want, give them another twirl in the food processor. Use dry crumbs within a few days, or put into freezer zip-lock bag and freeze, they are good for many months (at some point, they get that freezer taste). Good on pasta or salads. But they don’t keep. Use within an hour or so of making. This makes enough for 2 servings, double or triple as needed. My inspiration for this recipe is from Melissa Clark of the NYTimes... that one uses anchovies. Probably delicious, but haven't yet tried that! Warm olive oil over medium heat in small skillet. Add garlic and red peppers, stir, then add remaining ingredients. Cook for a few minutes, stirring frequently until the crumbs are golden. Add lots of pepper, and maybe salt (if you are using preserved lemons or salty olives, you probably don’t need more salt). Serves 4 … but 2 people can finish this off if they are hungry. Preheat oven to 425F, use convection bake if you have it. Line a sheet pan with parchment paper. 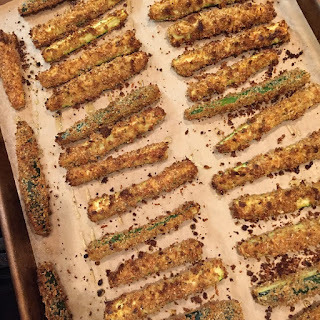 If zucchini are small, just quarter (and maybe cut the quarters in half if you have long skinny zucchini. If you have larger zucchini, cut into ½ inch slices. 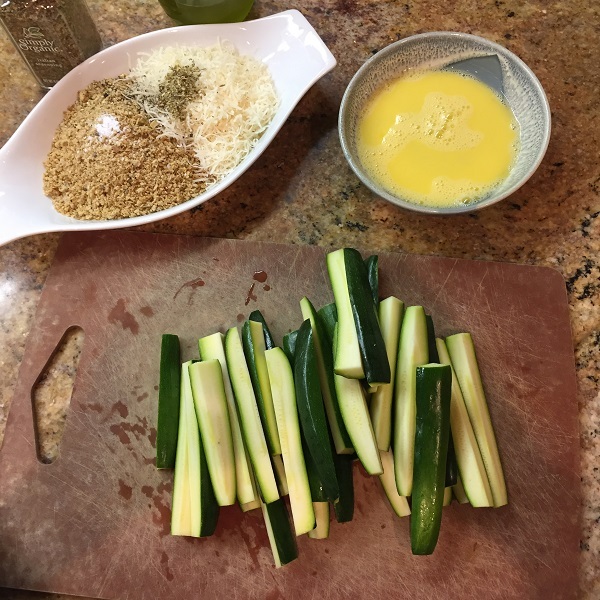 Dip each piece of zucchini in the beaten egg, then drop into the crumbs. Press crumbs on all sides. This goes a bit easier if you have one “wet” hand for the egg dip, and one “dry” hand for the crumbs. Place each coated piece on the prepared sheet pan. Drizzle the coated pieces with the olive oil. Bake for 20 – 30 minutes, until brown and crispy. No need to turn! Sprinkle with salt when they come out of the oven. Serve immediately with ranch or bleu cheese dressing, or marinara sauce. Place the garlic and lemon juice in a small bowl while you get the rest of the ingredients together… this helps tame the raw garlic. Whisk everything together. Chill until ready to use. Keeps for a few days.